While I waited on my last load to dry of the day, I thought I would add to my favorite things list. I blogged on another site about my OCD obsession with laundry…but I didn’t specify what tonics and tools I can’t live without to make my laundry AWESOME! I took all my towels out of the linen closet and started in. Three loads later I was convinced: Odo Ban DID IT! For the first time in many years, my towels smelled like towels! Not nasty, old, musty rags. They true test was letting them dry on the rack after a shower. Eureka! My towels dried fresh! I now use Odo Ban everywhere. It can be used on counter-tops, floors, curtains, rugs and upholstery. I had a sippy cup with milk “disappear” in my car. I found it several days later once my car started reeking. I cleaned the contaminated area with Odo Ban, sprayed the car’s interior, and the sour smell was completely gone. It truly is a miracle product. Hey Odo Ban are you out there? I love your product! Do you need a spokesperson? You’ve found her! My other “can’t live without” items are dryer balls. I discovered these quite by accident as well. My father in law gave me a gift certificate to an on-line “green” catalog and this was the only item listed that I either wanted, or I could afford. So I bought them on a whim. I can honestly say that I love them! My clothes come out of the dryer static free and I do think they have cut down on my drying time. My mother was visiting me last weekend and didn’t have a clue why I had blue rubber, knobby balls in my dryer. But they work, and I will never go back to dryer sheets. I have since found out they have "updated" their dryer balls to include special recipticals where you can insert fragrance sticks. Hmmm...I may have to get the upgrades! It’s now Sunday, and I am again staring at several more loads of laundry – why does it seem to multiply like rabbits? So, tomorrow, when I start in again, I will be so thankful for two of my favorite products, and even more thankful that the pool is closed on Mondays! 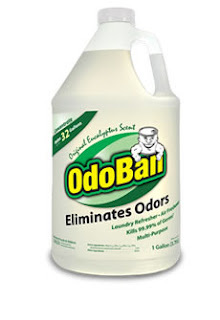 My laundry life has improved because of your suggestion of Odo Ban. 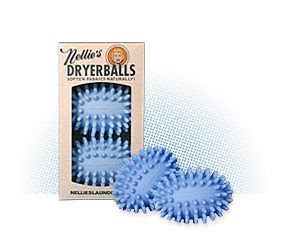 I've also just ordered some of Nellie's Dryerballs. Thanks for sharing your obsessions! oh heck, I can totally relate to many things here; the messy house in summer, laundry struggles, roaring twenties bathing suits! Now I just need some websites to help me with my get-that-stain-out obsession. Never heard of dryerballs. have to try it. I think I'm going to have to try both of these! May go to Sam's today just to get some! I think you're overthinking the pool. Honestly. You'd be amazed at what hangs out at our pool every day---and unashamedly so. In fact, seeing all these women just letting it all hang out had actually made me more confident in myself. And trust me, babe, you look lots better than most people out there. Truly. I would just hate for you to miss out on something that can be really fun for your kids because of a false perception.